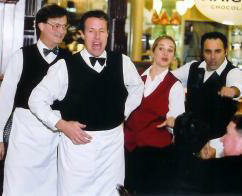 The Melbourne Singing Waiters DO NOT SING OPERA. The Melbourne Singing Waiters dress just like the other real waiters and begin the night by welcoming guests and helping to serve the food and drink. The guests begin to realize that all is not as it should be, as the waiters become clumsy, flirty and one even appears to be inebriated. Then just as the dinner plates are being cleared, one of the waiters goes on stage and announces that the band hasn’t turned up or s ill, but not to worry because some of the waiters are prepared to give it a go. 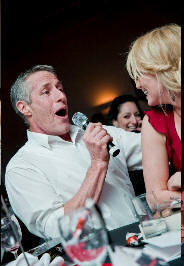 He then invites three other waiters on to the stage and they burst into song. 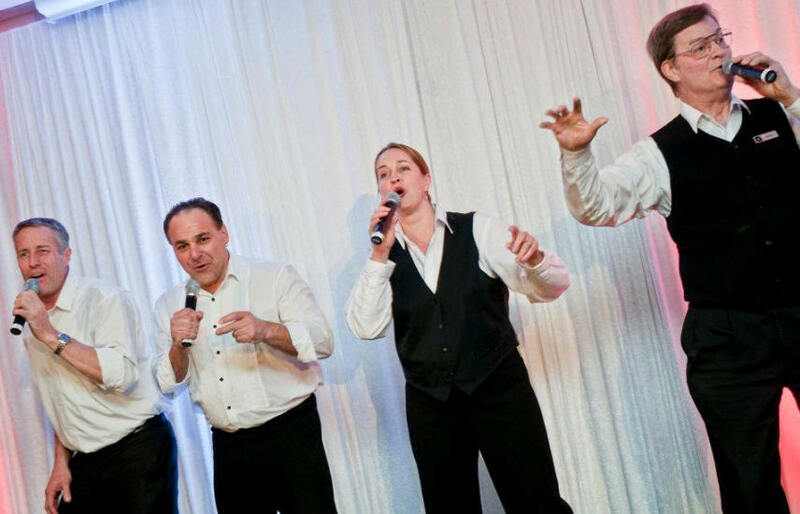 Using no instruments apart from their voices, the Singing Waiters engage the audience with their beautiful harmonies, comedy and lousy choreography. 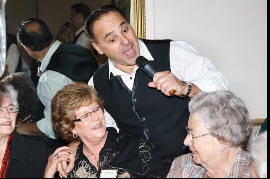 The Singing Waiters perform hits from the 50’s to the 90’s and are ideal for audiences of all ages. “Hi Matthew and singers, Thank you very much for delivering such an awesome piece of entertainment. It was thoroughly enjoyed by our delegates and you are all very talented! 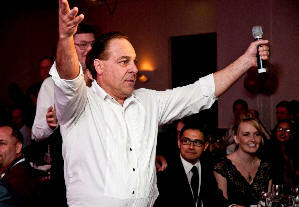 “Hi Matthew, The event was fantastic; Excellent and very much appreciated by the crowd! We loved the Singing Waiters! They were funny, friendly and very gifted! “Dear Matthew. 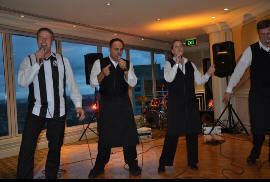 Thank you so very much for the wonderful performance of The Singing Waiters at our Supporter Thank You Luncheon last Thursday. Your group is sensational and we received some lovely feedback from people who attended the occasion. Your choice of music was great and I definitely saw a few toes tapping to the rhythm. Mary Quirk | Bequest Officer. Central Offic. Baptcare. October 2010. Hi Matthew, Thank you singing waiters. You all did a fantastic job - even the real waiting staff were all very impressed. Thank you very much! The night was fabulous and everyone said they had a great night, so thank you for being a part of it”. 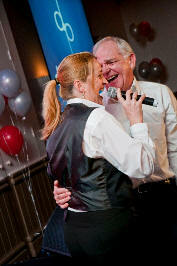 “The Singing Waiters were fabulous – they were a great start to the night! We would not hesitate to recommend them to anyone. “Thanks so much for your amazing input to our Barmitzvah function last Friday. We have spent much of the weekend hearing snippets from delighted family and friends regarding your antics before you revealed your identity and accolades on the musical performance and subsequent humour as well. A few of the catering staff have now resigned their positions after the shock of being “had” on the evening! We are delighted that you were able to add to our celebration in such a great way. Please pass on our thanks to Sig and Michael as well. “Please pass my thanks on to the Singing Waiters for a wonderful performance. As you would have realised the entertainment was perfectly matched to the crowd. I thought it might be hard to hold their attention after a few drinks but you had them right throughout your set. The crowd participation created a great atmosphere. Robyn informed me that you were a great bunch of people to work with making it an enjoyable experience for everyone.